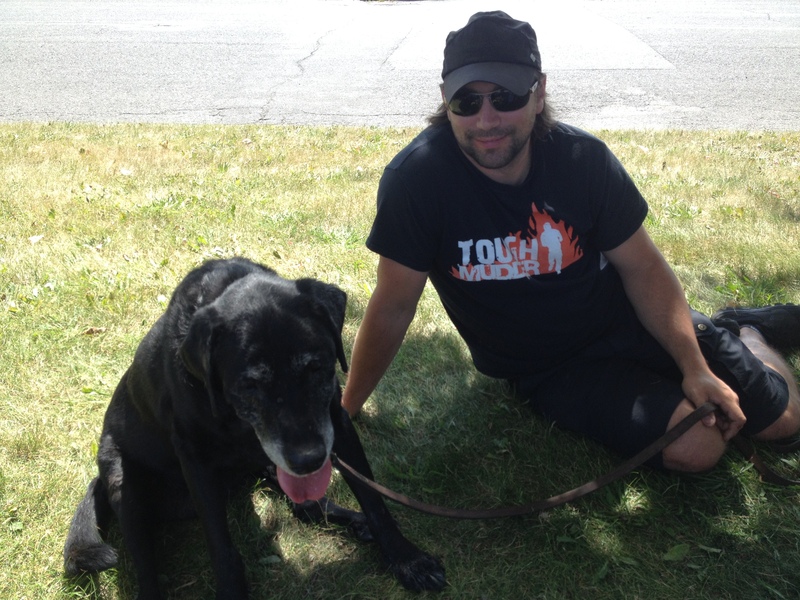 I had an awful start to my day earlier this week, wondering if our dog Casey was finally reaching her last days. Casey is our black lab. She’s old and grey and in her 15th year. She’s deaf and smelly and sleeps most of the time, but in our eyes, she’s been the best dog we could ever have hoped for. Twice now we’ve encountered moments that made us wonder “Is this it? Is her time up?”, and it’s been heart-rending. The first was over two years ago when she lost the use of her two rear legs. Fortunately she regained function and has been with us ever since. The second time was a few mornings ago. 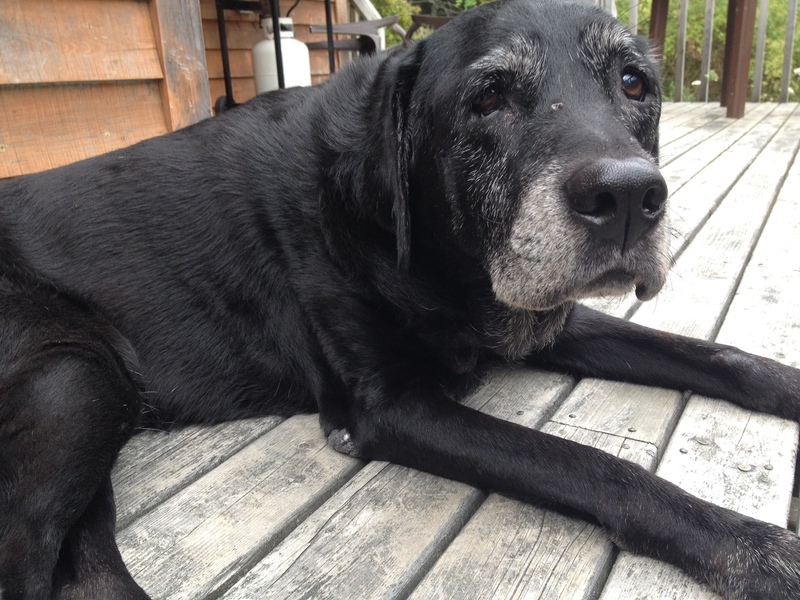 To put it in perspective, a 15 year old lab is like a 100 year old human. We know she is winding down, and I will readily admit that I get anxious over losing her. 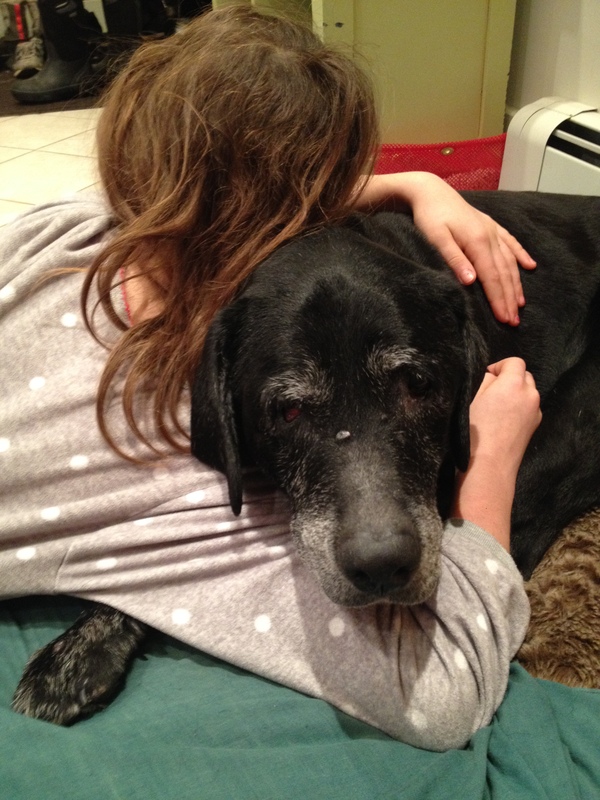 To know that there is heart break coming our way isn’t a pleasant feeling, but it is a reality when you love an old dog. Months back, I had accepted that there was probably a 50/50 chance of Casey still being around to move across the country with us. And as the moving date approached, I was nervous about how she would do with the 2000 km drive. But she was a trooper and travelled like a champ, while I took great pleasure in knowing that she would end her days on Nova Scotia soil. 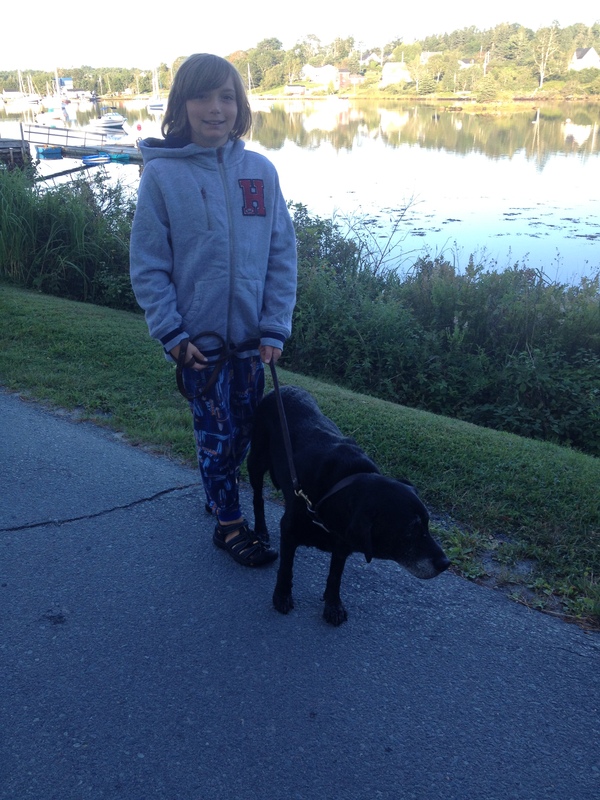 I relished our slow morning walks along the oceanside road in Hubbards where we stayed for our first month. I enjoyed the fall days walking her around the beautiful gardens in our new back yard. (The irony did not escape us that we finally have acres to romp in, but with a dog who no longer romps). Through it all, however, we watched her slow decline. Yes, she still eats with gusto, and loves to snoop outside, but her walks have gotten shorter – especially this past month since the snow arrived. She slips and falls more often. It takes a lot of effort for her to get up from lying down, and she rarely greets anyone with so much as a tail wag. Actually, she rarely notices if people arrive at all, and often snores her way through visits in deaf oblivion. I find myself wondering “Will I know when her time is up?” and “Is she suffering in ways that I can’t tell?” I hope that when it happens it won’t be with any decision-making on my part, and that she passes quietly in her sleep. (And selfishly, that I am not alone when she is discovered). Casey smells – that’s one thing about owning a dog that I won’t miss. For the past year she has been known to poop randomly in the house, occasionally in her sleep, and sometimes – infuriatingly – in the house immediately upon coming in from a walk. In the past few months, she’s even started peeing in the house. Our window of time for her to hold her bladder has gone from all day (if needed) to 4 hours. And there were some days last week that she even peed in the house when I was right there to let her out. We now need to arrange dog-walkers if we will be out all day – or to arrange our days to include pit-stops at home in the midst of our travels. The irony isn’t lost on me that as our kids’ dependancy on us (and bathroom / clean up roles) have decreased and given us more freedom – we’ve become tied down by taking care of Casey. Dean has taken the past-midnight-shift to let her out, while I’m up by 6am to start the day with her. Every morning now I walk down the stairs wondering if she will have made it through without peeing everywhere. My morning routine of Amy-time has become one of mopping, walking, and cleaning. I have a mini-celebration every day I come down to a clean floor. But we’ve chalked it up to life with an old dog. We see the signs of her decline, but also still see her healthy appetite and easy-going personality. We haven’t seen signs of her being about to go, and we haven’t been ready to consider when that might be. Thursday morning I came down and did a happy-dance that there was no mess to clean up. I quickly strapped Casey’s leash on to head outside for a walk. But she was extra slow in getting up – and then proceeded to pee immediately upon standing. As I watched in sleepy confusion, she trembled and peed, then fell and began shaking on the floor, with little stones all through the mess. Kidney stones?! My dog just peed out over a dozen kidney stones?! I know what kind of pain that causes in humans, and I felt nauseous. I helped her to her feet and got her outside – where she stumbled and fell several times, in obvious pain. Once back inside, she laid back down rather than going to her food, while I cleaned up the mess and wondered what to do. With my stomach in knots, and an ache in my heart, I got the kids ready for school. I tried to hide my concern from them, but nothing passes Audra’s observant eyes. I tried not to cry, but didn’t do so well keeping it together while I explained, yet again, about Casey being an old dog who wouldn’t be with us for too much longer. I didn’t hide from them the fact that she had passed kidney stones and was in pain. But I did hide from them my deep-seated fear that this was it. As they went out the door, Dean came downstairs to be surprised by my flying, tearful hug as I gulped out my dreaded fear that this might be Casey’s last day. Having a beloved pet brings with it a level of love that is not explainable with words. Casey was our first baby, and has been with us through almost our entire lives together as a couple. She has travelled across Canada with us. She ran circles around us as we hiked up the mountain in Kananaskis where we got engaged. She has lived with us in 2 different apartments and 2 different houses in Ontario, before moving to Nova Scotia this past year. She was there at the births of both of our children (literally, as we had them born at home), and I will forever remember her calm presence and how it helped me cope when I was in labour with Ethan. She was Audra’s source of comfort even as a toddler, when she would cuddle in to Casey whenever she was frustrated about anything. She has been the most athletic, gentle and loving dog we could ever ask for. I don’t doubt that I will feel a huge void in my life when she goes. But getting back to our story – Casey is still here with us a few days later. It wasn’t quite her time to go – but I know it is coming soon. When we had her at the vet, they agreed that she likely had a matter of months left, and supported our plan to keep her comfortable and with some quality of life for the remainder of her days. 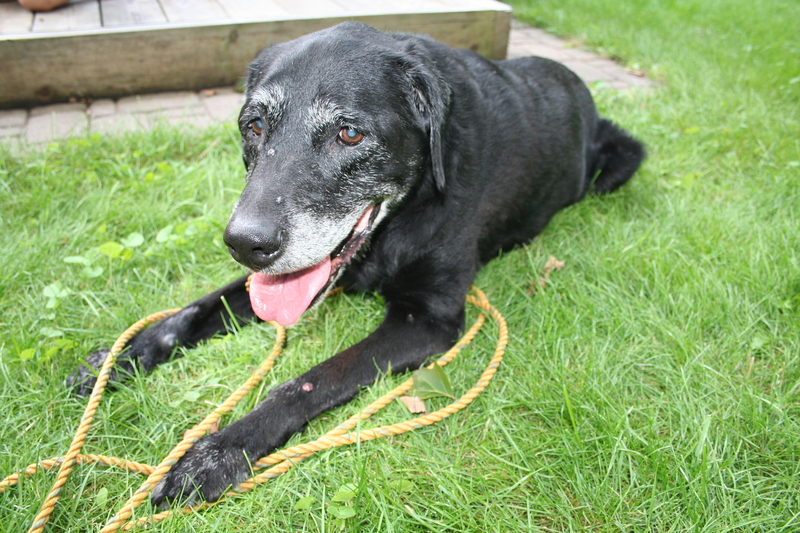 They pointed out how rare it was for a 15-year-old lab to be medication-free (unfortunately, most dogs are like the majority of people in their 90’s who are often on multiple medications). They pointed out the signs of what was good with her still – a great-sounding heart, a curious personality, a healthy appetite and healthy stools – as well as what was not so good: namely that she was in a lot of pain due to a raging bladder infection and her deteriorating hips. We readily agreed to a medicated solution for her. While our personal approach to health for ourselves and our dog has always been ‘natural first’ – in this case, we knew that medications were the best and fastest way to help Casey regain some quality of life. We happily paid for a course of antibiotics and pain medications, content that there was something yet to be done. Her response to the medications was almost immediate, with her bladder control seeming to improve overnight, while she moved with greater ease by the next day. She is even a little less smelly due to the medicated shampoo we got to help with her allergies and skin. We are happy to see signs of her greater comfort and mobility (as well as no messes to clean up in the house). However, while I am relieved that this wasn’t quite ‘it’ – I know her days are growing shorter. I am both grateful and a little heart-achy when I look at her. I still hope to one day find that she has passed quietly into her forever-sleep. We have discussed this with our kids and they have plans for how they want to bury her and remember her. Dean and I agree that we may never get another dog once she goes. Who could replace Casey? No other dog on earth in our minds. At least not for a long, long time. Poor Casey! Sorry to hear that she’s been having a hard time lately, but it sounds like she’s gotten the help that she needed 🙂 Hope that she stays on the road of recovery for awhile! Give her a little squeeze from me! I sure will, Naomi! If we were still in Ontario, I’m sure you would have been on our short list of people to call. Happy to say she is perkier and moving faster now. She even thinks she can do stairs again… ! (not that we will let her!!) I just feel bad for not realizing how much pain she was in, but glad to be doing better now. No other dog will ever “replace” Casey, I’ve heard people say that numerous times, but this is so untrue, One might be able to have another pet in their life, but a replacement of another one who passed, NEVER happens… and they’ll never be forgotten, I know, I’ve been in that situation several times, very sad, but a reality, they cannot be with us, (as much as we’d love), forever. I feel for you all, it’s tough, tough….. but I look at it, like they were such a huge part of my family, they’ll never be forgotten by any of us.